Really has it been a decade that Aadat was released, still the song has a mesmerizing effect on people. The general reaction when the song was first time gone viral is the same now. This song brought a revolution the pop / rock music and which not only status within the domestic boundary but listened beyond boundaries. Embarked with a defined moment I the past Aadat is still relevant, which is appalling, given that a decade has passed since it first hit the airwaves. Aadat was released on 2003 when two novice musicians named Atif Aslam and Goher Mumtaz released Aadat as the duo Jal, a track which was one of the biggest hit of its time and became the most popular song amongst youth. When the representative of The Express Tribune spoke to well-known Pakistani musicians regarding “why this song Aadat has created such an impact and became a sensational hit in music industry. He chooses not to give any comment with this regard despite repeated attempts to contact him. 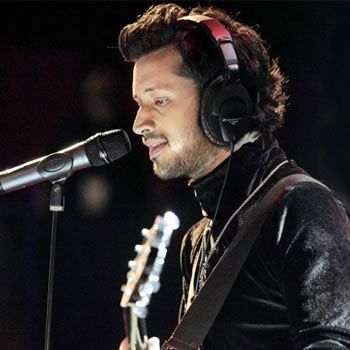 Even for the Mega star Atif Aslam the sheer scale of Aadat’s success was unfathomable, he had the idea of immense popularity the song gain when it was first aired, but it did not sink in fully until a friend called him from Karachi to tell an interesting story. Music producer , Faisal Rafi worked with acts such as Strings, Karavan and Kaavish to name a few, believes that while Aadat didn’t necessarily offer something new, but it surly has opened many other doors for Pakistani musicians.“ I think the most important contribution the song made was taking this the first Pop/Rock song to go to Bollywood, and opened opportunities for every other band/artist across the border. We already had the likes of Nusrat Fateh Ali Khan going there, but not a young Pop act per say,” he further added. “Aadat was where it began for me. It changed my life, its success strengthened my faith and lead me to record my first album, which in turn resulted in my going to India to pursue a career in playback; none of which would have been possible without Aadat,” says Atif. Aslam, on the other hand, realizes his naivety during his Aadat days and considers the experience one that made him more humble about his music. “We thought we knew everything, but we were wrong. Such is the joy of teenage hubris. I’ve grown up since then, Aadat and Jal were over a decade ago,” Aslam concludes. Faraz Anwar, guitar virtuoso “It certainly didn’t offer anything new. The chord progression was generic, and Atif’s style of singing was very much inspired by Ali Azmat. It was this combination that really worked for the audience,” says Anwar. “Critically speaking, Aadat was not the best song of its time, but it is one that the young public connected with the most,” says Haque. While Aslam may have moved on, it is undeniable that Aadat had a long reaching effect, one that is still making waves in the industry today. How To Grow Your Beard? MARIAH CAREY AND JAMES PACKER: DO THEY BELONG TOGETHER?